The meeting will be held at the Washington Marriott Wardman Park in Washington, DC. 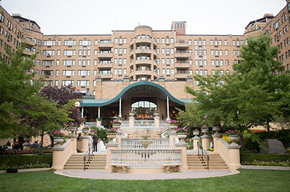 The main block of sleeping rooms has been reserved at the Marriott Wardman Park with an additional overflow room block at the hotel listed below. You must register for the conference prior to obtaining the link to reserve your room. After you have registered for the conference, a confirmation email will be sent complete with the information you’ll need to book at the properties. We expect the hotels to sell out quickly, so register and make your reservation today! *Shuttle service will not be provided between the Washington Marriott Wardman Park and the Omni Shoreham hotel. A valid credit card must be provided at the time the reservation is made and will be charged a deposit of one night’s room and tax by the hotel as early as June 21, 2019. Cancellations must be made 72 hours prior to arrival for a full refund of the one night's room and tax deposit. In addition, the 340B Coalition's housing bureau, Orchid Events, will charge a $100 cancellation fee for all cancellations made after June 14th. Should you cancel, this charge will appear on your credit card statement as “Hotel Cancel Fee”. This policy will apply until 72 hours prior to arrival when the hotel's cancellation policy goes into effect.